I'm continuing to enjoy my Galaxy S3, and of course, needed to get a case for it. My preference has always been to wear my phone on my belt via a clip or holster. I suppose it's the closest I'll ever get to owning a Bat Belt. It also keeps my pockets free to stuff with other goodies. And while I've owned some chunky phones before, the S3 is by far the largest screen size I've carried. It's large enough that I thought I might finally have to give up on wearing my phone on my hip. Heck, I wasn't sure if it would even go in a pocket. Still, I figured belt-carry was worth a try, so I picked up the Aduro Shell Holster Combo Case from Amazon. For $13.00, it was hardly a big risk. The case, I'm pleased to report, is working well. It comes in two parts: the first snaps on to the back of the phone, the second, to your belt. I was concerned that the snap on section would turn my wonderfully slim phone into a bulky monstrosity, but it doesn't. If anything, it has made the phone feel a bit more substantial and the textured feel makes it easier to grip. The phone slides in and out of the holster with ease, and when it's in, feels nice and secure. I have yet to get any real use out of the kickstand, but in a few quick tests, it has worked well. It's a nice little bonus and doesn't get in the way when not in use. All in all, I couldn't be happier. I'm able to wear my phone on my belt, and do so without unnecessarily bulking up the device. 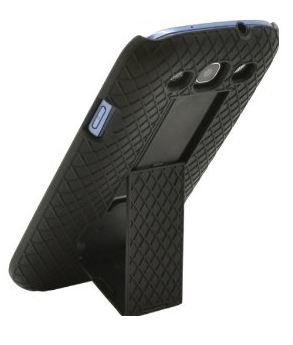 If your lean towards holster carry for your phone, and you've got an S3, definitely check this case out.